In a program conducted between 1979 and 1982, the NASA Dryden (now Armstrong) Flight Research Center in Edwards, California, successfully demonstrated an aircraft wing that can be pivoted obliquely from zero to 60 degrees during flight. 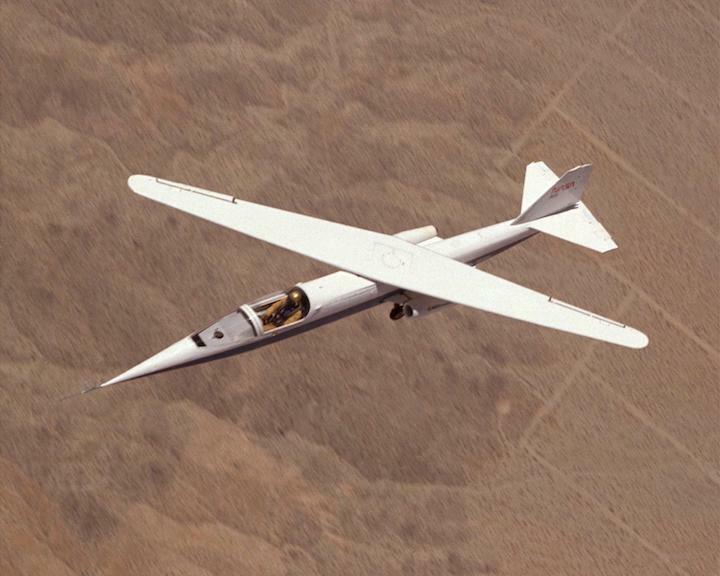 The program demonstrated the unique wing on a small subsonic jet-powered research aircraft called the AD-1 (Ames Dryden -1). 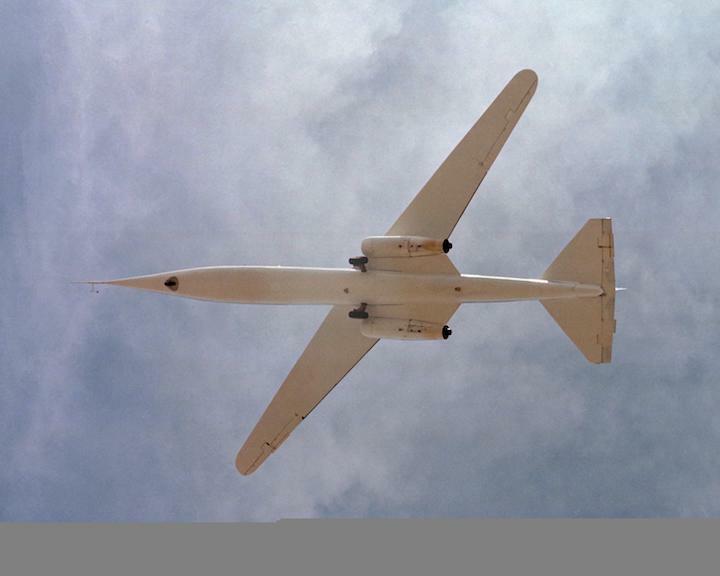 The aircraft flew a total of 79 times (including flights by guest pilots and those to air shows) in a research program that evaluated the basic pivot wing concept and gathered information on handling qualities and aerodynamics at various speeds and degrees of pivot. The oblique wing concept originated with Robert T. Jones, the distinguished aeronautical engineer at NASA's Ames Research Center in Moffett Field, California, who had been instrumental in developing swept and delta wings during and after World War II. Jones initiated analytical and wind tunnel studies indicated that a transport-size aircraft with an oblique wing, flying at l,000 mph, might achieve twice the fuel economy of more conventional wings. At high speeds, both subsonic and supersonic, the wing would be pivoted fore and aft at up to 60 degrees to the aircraft's fuselage to gain (essentially) the high-speed efficiency of the swept wing. The studies indicated that these angles would decrease aerodynamic drag, permitting increased speed and providing a longer range with the same fuel expenditure. At lower speeds, during takeoffs and landings, the wing would be perpendicular to the fuselage like a conventional wing to provide maximum lift and control qualities. As the aircraft gained speed, the wing would be pivoted to increase the oblique angle, thereby reducing the drag and decreasing fuel consumption. The AD-1 aircraft was delivered to Dryden in February 1979. It was constructed by the Ames Industrial Co. in Bohemia, New York, under a $240,000 fixed-price contract, with later modifications raising the price. Piloting the aircraft on its first flight Dec. 21, 1979, was NASA research pilot Thomas C. McMurtry, who was also the pilot on the final flight Aug. 7, 1982. Powered by two small turbojet engines, each producing 220 pounds of thrust as measured at sea level, the aircraft had a top speed of about 200 mph. The AD-1 was 40 feet in length and had a wingspan of 32 feet. It was constructed of composite materials, primarily fiberglass, and had a gross weight of about 2,000 pounds. A fixed tricycle landing gear, mounted close to the fuselage to lessen aerodynamic drag, gave the aircraft a very "squatty" appearance on the ground. The wing was pivoted by an electrically driven gear mechanism located inside the fuselage, just forward of the engines. The research program to validate the oblique wing concept was very typical of any NASA high-risk project -- advance through each test element and expand the operating envelope very methodically and carefully. The AD-1 was flown 79 times, beginning with its first flight late in 1979. The wing was pivoted incrementally over the next 18 months until the full 60-degree angle was reached in mid 1981. The aircraft continued to be flown for another year, obtaining data at various speeds and wing pivot angles until the final flight in August 1982. Though the AD-1 had unpleasant flying characteristics and had poor handling qualities at extreme oblique wing-sweep angles, modern digital flight control systems might be able to overcome this challenge. In 2005, government and industry partners started looking again at the scissor-wing concept for a proposed long-range stealthy supersonic military aircraft. The AD-1 aircraft in flight with its wing swept at 60 degrees, the maximum sweep angle. The AD-1 aircraft was designed to investigate the concept of an oblique (pivoting) wing. The wing could be rotated on its center pivot, so that it could be set at its most efficient angle for the speed at which the aircraft was flying.